balEnce is a selective insect-eating fungus, Beauveria bassiana, that kills adult flies but is safe to use around animals. Is a naturally occurring, environmentally friendly fungus (Beauveria bassiana) that specifically targets flies. balEnce™ is a suspension of the spores (conidia) of Beauveria bassiana, an insect-eating fungus, that is fogged around animal rearing areas and sprayed into chicken house manure pits. The spore is picked up by the fly, grows and reproduces inside the insect and kills it. 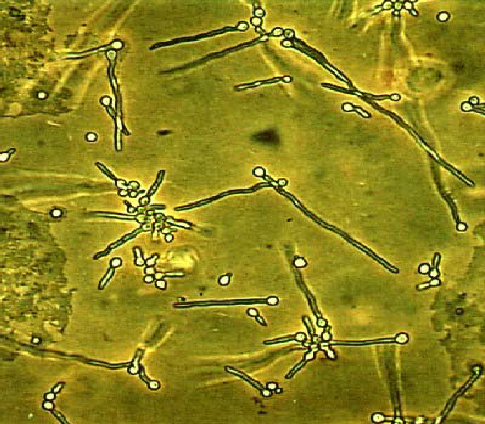 The circles in the above photomicrograph are the fungal spores. They begin to grow by producing germ tubes. As the fungus grows in the fly, the fly dies. balEnce™ is an insect specific pathogen and has no impact on mammals or other beneficial insects. balEnce™ residual stays on surfaces for more than 21 days. 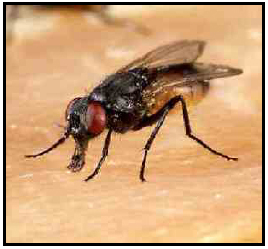 Flies die in 36 hours to five days depending on exposure and environment. As the flies die, other beneficial insects take over their natural role of killing the fly population at the larval stage. Combine with trapping adult flies, manure management and releasing fly parasites, for a full program. Once control is gained, treat only as needed, the beneficial insects will do the rest - balEnce™is very economical to use. The poultry manure is chemical free - producers sell their pesticide-free manure at a premium. Kills flies that are resistant to many chemicals. balEnce™ is a selective insect-eating (entomopathogen) fungus, Beauveria bassiana that infects adult flies but is safe for beneficial insects, humans, poultry and the environment. Once balEnce™ is released into the manure storage pit area of the house, the spores are picked up by the fly adults where the spores germinate and enter the flies. The fungus grows until it has consumed and killed the fly. Each 15 oz. container of balEnce™ treats up to a 50,000 square feet. Remember to shake the container of balEnce™ vigorously before mixing with water in the backpack sprayer or other fogging equipment, to insure that all spores are suspended. Maximum usage should not exceed four containers of balEnce™ per week per building. Fans should be off or at minimal velocity while treating to allow the material to settle on building and manure surfaces. Fog into fly infested areas at a rate of 1 oz per 3,000 ft2 as needed. For the most effective fly management, leave a dry base cone of manure containing beneficial insects in the pit after the clean out. 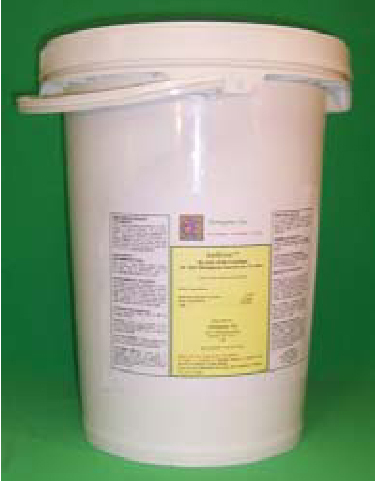 Treat manure pile four times a week as follows: Shake container well to suspend all spores. Place ½ (7.5 oz) container of balEnce™ into the backpack mist blower, or other fogging equipment, and dilute with three to four gallons of water. Spray ½ of the pit area, directing the 40 to 60 micron mist from cage bottoms and onto manure pile. When finished, place the remainder 1/2 of a bottle into the mist blower and repeat the treatment on the other ½ of the house. This treatment schedule should be maintained for two to three weeks. As adult fly numbers begin to decline and manure condition improves, treatment frequency may be reduced to three times a week and finally to two times a week. 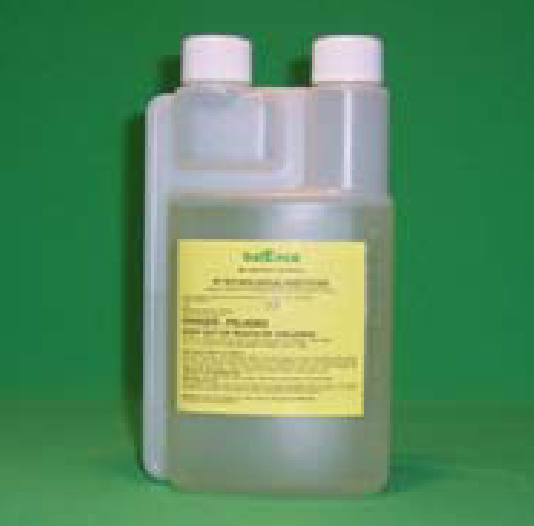 The total amount of balEnce™ used should be maintained at two bottles per week until manure condition no longer supports fly breeding and fly numbers have decreased. Evaluation of the level of pupae in the manure pit at the end of the first month will determine the balEnce™ treatment interval. The residual level of fly pupae in the manure after treatment determines the fly population for the following 21 to 35 days. This time period will vary – in cooler temperatures it could be as long as 60 to 90 days for all flies to emerge from these residual pupae. In a facility where manure has a good cone and ventilation sufficient to begin or maintain the drying process, applications of balEnce™ two times per week in the pit for four weeks has been shown to be effective in reducing fly numbers to below further treatment threshold levels. If the manure moisture level is high, and uncontrolled fly breeding is taking place, treatment may be needed more frequently until the manure can be dried and the breeding area reduced. Because balEnce™ impacts only flies, the beneficial species continue to increase and as the manure is returned to the proper moisture level, fly populations are under control and the use of balEnce™ is reduced or discontinued – a significant saving when compared to the routine use of chemical sprays. balEnce™ can be used at any time of the year, regardless of temperature. Thus, balEnce™ will also enable a winter control program to eliminate fly breeding in the cold months, reducing the spring fly explosion and allowing extra time to dry winter manure to acceptable levels. Because balEnce™ is a natural, safe, environmentally friendly and fly specific insecticide, it does not leave a toxic chemical residue in the manure. The manure from houses treated with balEnce™ has sold for a significant premium, which may represent enough revenue to pay for the use of balEnce™ in controlling flies. The development of balEnce™ represents a major new breakthrough in fly management. It is a cost effective, environmentally safe method of fly control.